I just finished playing the PC version of Assassin's Creed. In this game you play Desmond Miles who has been kidnapped by an evil pharmaceutical company in the near future. This company, Abstergo, has created a device called the Animus that is capable of simulating events (memories) coded in the DNA of the user. 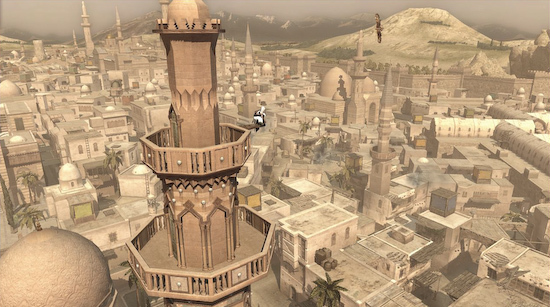 When Desmond uses the machine (he is actually forced to), he relives the memories of his ancestors - specifically those of Altair (pronounced al-ta-ear), assassin during the Third Crusade. Apparently, the scientists at Abstergo are looking for something and trying to recover this information from Desmond's mind. Unfortunately, the hereditary memory that they need to access is buried pretty deep, so we (the game player) gets to unlock memories in such an order that the story of Altair and the Brotherhood of Assassins. The story unfolds primarily in the world of Altair with occasional interruptions as we're yanked back into Desmond's time due to Animus problems and events occurring at Abstergo. As the game unfolds it becomes more clear how Abstergo and the memories they are so interested in retrieving are connected. I spent the last couple weeks playing Jade Empire: Special Edition. Often, I find that once I get to a certain pointwhile playing a game, I just can't go any further. It's not that I don't want to finish or that I'm bored of the game, it's just that I lose motivation.This happened to me for Neverwinter Nights 2, I got past Act II, but I can't bring myself to load up the game to keep going to finish Act III. I don't know why, I'm just tired of it. Jade Empire was well designed in that the later chapters move quickly so you feel like you're rapidly making progress. I enjoyed the environment that Jade Empire presented, although some of the characters are a bit weird and Drunken Master style actually relies on the martial artist imbibing alcohol. I wrote up a full review on Fanpop that you might like to read if you're interested in Jade Empire. Through random clicking, I found JayIsGames and on JayIsGames I found a fun little game called Hoshi Saga. The objective of Hoshi Saga is always the same: display a five pointed star on the screen. How you go about it is very different for each of the 35 levels. 25 levels are available for play with 10 levels that are revealed, one at a time, whenever you complete a row or column of these simple yet satisfying puzzles. It's best not to say too much about the puzzles, but I will provide the hint that you should try everything - clicking, dragging, swirling your mouse, etc. Sometimes there will be visual clues, sometimes not. But all of them are pretty much solvable. I've been playing Neverwinter Nights 2 for the last couple months. It seems like it's been forever. I'm not like those game reviewers who run through a game as fast as they can (and then accuse the game of having no depth or character development because they skipped through most of the side quests or dialogue), instead, I like to see as much of the game as possible. Unfortunately, this can be very time consuming for a game like Neverwinter Nights 2, which seems to be taking forever. For me, a lot of playing an RPG is building up your character and equipment (for in NWN2, you can actually craft weapons and armor) and trying them out in combat. The problem is, Neverwinter Nights has a lot of stuff going on - the mystery that your character is involved in, preparing for a war, building a stronghold, learning more about your sidekicks, and dungeon crawling all in the same game. The game play is really nice and the mechanics are sound, but I wouldn't mind getting done with the game and moving onto Jade Empire - a game I've waited for two years to come out on PC and one that I bought immediately upon it's release but haven't had a chance to play yet.